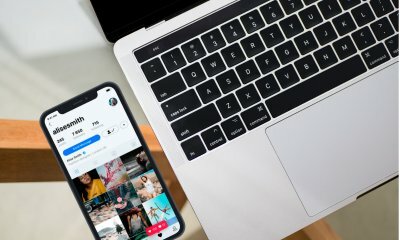 At the time when you are reading this tutorial, millions, or billions of other users out there are probably browsing through an app on their smartphones. Having a smartphone with a huge collection of apps has already been an integral part of our lives. With so many users constantly engaging in mobile apps daily, we have to be certain that the User Interface (UI) runs smoothly, doesn’t frustrate users, and this can be achieved through well-written automation testings. Special thanks to Sauce Labs, they have launched Appium in the recent years to help Test Engineers run automated UI tests, which are centralised in one platform. 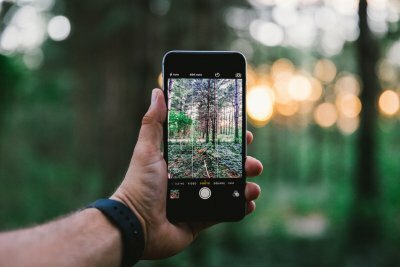 So in this tutorial, I will walk you through what Appium is and how you can make use of the tool to automate UI testing for iOS apps. First things first, what the heck is Appium? Appium is an open-source test automation tool. It is essentially a HTTP Web Server (client-server architecture) which is able to manage multiple WebDriver sessions and it exposes REST API. When coupled with Selenium WebDriver API and language-specific client libraries, it gets even more capabilities to write more advanced test cases that can cover from native to cross-platform apps. Moreover, you can write the test cases in the language of your choice (i.e. C#, .NET, Java, node, Perl, PHP, Python, Ruby, etc). The best part of Appium is that it supports most kinds of apps including native, mobile web and hybrid applications. This means you can run your tests on both iOS and Android! How does the automation works? I’m glad you ask! Simple! For example, your wrote your test cases in Python, which I am going to do so in this tutorial; Selenium’s WebDriver will translate it into native iOS and Android commands. These commands will then be sent to the native drivers on your simulators or real devices. Editor’s note: To learn more about how Appium works, please refer to the official documentation. Tell me one more good thing about Appium! Appium was designed to meet mobile automation needs according to a philosophy outlined by the following four tenets: 1. You shouldn’t have to recompile your app or modify it in any way in order to automate it; 2. You shouldn’t be locked into a specific language or framework to write and run your tests; 3. A mobile automation framework shouldn’t reinvent the wheel when it comes to automation APIs; 4. A mobile automation framework should be open source, in spirit and practice as well as in name! Sure! Apps have their UI elements already wired up is ready to have their test cases run. They just need to simply pick out the app and the standard API will handle everything without the need to recompile the app! However, there is a catch. Since both native platforms (iOS and Android) has very different UI elements, you will need to write two suites of test cases. 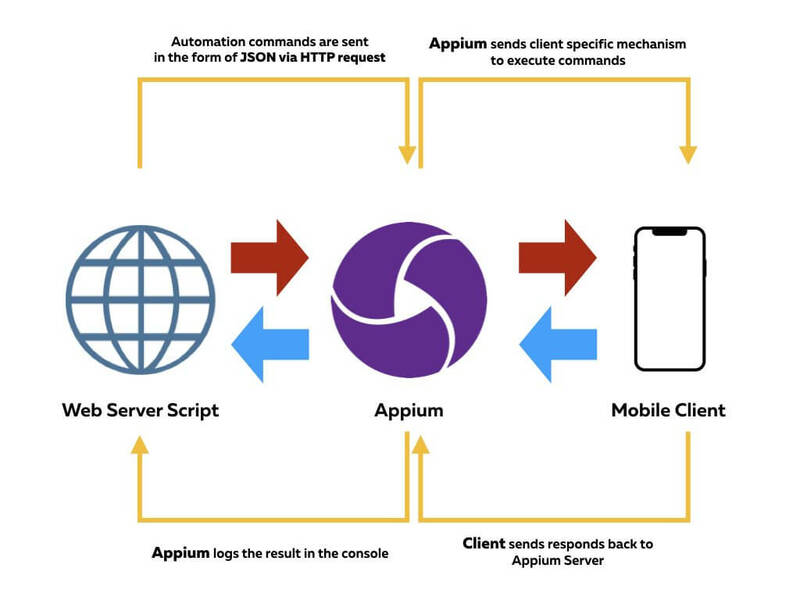 This diagram briefly suggests the communication paths between Appium, client and web script. Some basic knowledge in iOS Programming in Swift. Xcode 9.4.1 or later installed on your macOS. 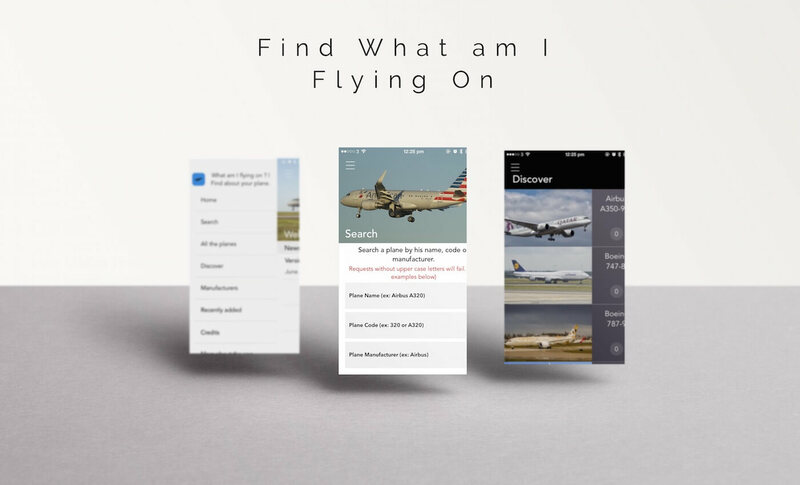 A passion to learn how to run UI automation test on your iOS project. After you installed Appium, verify that you have appium setup by running appium in the terminal. Great! Now that you have Appium setup, let’s move on to the client side. The user keys in his/her email in the text field such that the email address should be in a valid format. The user keys in his/her password in the password field that the password should be masked. When the user hits the Login button, the user should see a smiley image. We will implement these test cases using Appium. To keep you focus on building your test cases, you can download the demo project here. For UI test automation, there must be some ways for the test tool to identify the UI elements. One of the many ways for Appium to identify the right UI element for testing is through the Accessibility ID. Now open the Xcode project and go to Main.storyboard. Select the email text field and go to the Identity inspector. Under the Accessibility section, enable Accessibility for the field. Give the label a name like Email TextField and fill in the identifier as emailTextField. This is the unique ID that we will use in the Python test script for identifying the UI element. Great! We have our client setup, ready to receive commands! For the purpose of this project, I will be using Python script as my chosen language. You could explore other languages by looking through their API Documentation. Next, select a folder to create your workspace. For me, I put it under Documents/workspace/appium-ios-basic/tests. Create a file named test_login.py where .py is a file extension for python. You can use TextEditor like Sublime Text or IDE like Atom to edit your script. My personal preference is Atom because of the nice UI. These are the basic functions we need for executing our test cases. You will need to replace the app with the absolute path to your AppiumTest.app on your local machine. Depending on the time you read this tutorial, you may need to adjust the platformVersion and deviceName to suit your needs. You could leave the rest as it is. However, if you are running Appium on another server, feel free to change the url. After the test cases are fully executed, it is important to release the driver. self.driver.find_element_by_accessibility_id search for the emailTextField UI element and assign it to emailTF. Next, we will key in a valid email address by using send_keys. Once done, we will press Return by using Keys.RETURN. Then we call sleep to delay 1 second. Lastly, we test if the value we retrieve from the text field is the same as the expected value using assert. The code looks very similar to that of the first test case. The key difference here is that we use assertNotEqual. We want to make sure the value of the password field is masked. We simply call each test function sequentially. Then we locate the loginButton and call the click() function to click. Finally, we test the visibility of the smiley image and we are done! Oh! Wait a minute, we need to call main to execute this entire class code for us! We are done with setting up our test cases. Now let’s get to the exciting part of running all these and seeing it in action! Alternatively, you can head over to Appium to download the source and install it. This is the main connector that is crucial to make sure Appium speaks the right language to our client. This small python framework is a full-featured advance testing tool to aid in our testings! We may not need the full functionality of this framework in this tutorial but the very nice formatted loggings makes our test cases look pleasing to our eyes! Appium’s primary support for automating iOS apps is via the XCUITest driver. This driver leverages Apple’s XCUITest libraries under the hood in order to facilitate automation of your app. This access to XCUITest is mediated by the WebDriverAgent server. For the test_login.py file, please ensure you change the app path accordingly. 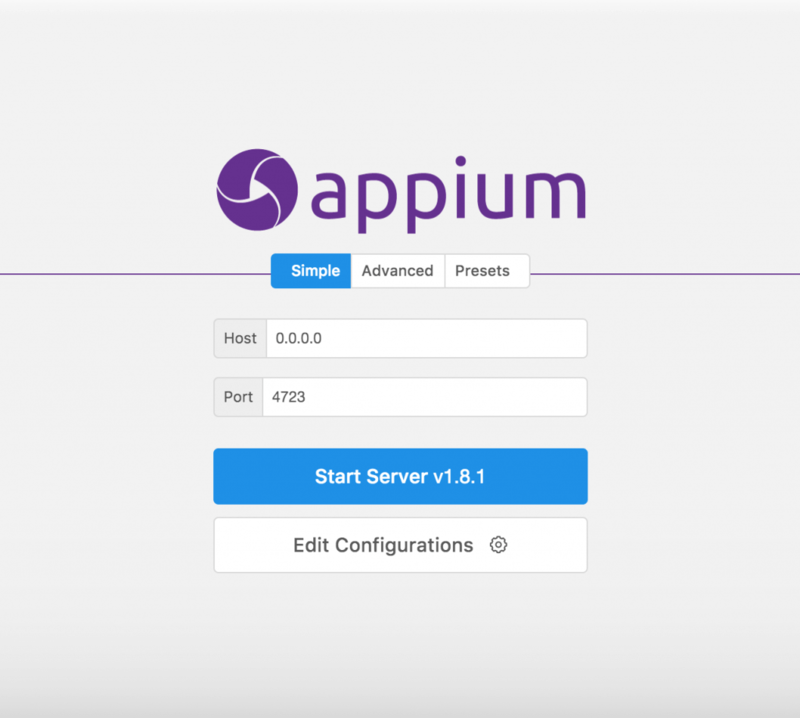 And, your Appium server performs the automated commands! You should see a message specifying the time taken to execute the test and how many of the test cases passed! Hurray! We learnt in theory how Appium interacts with Web Script and Client. We learnt how to setup Appium. We learnt how to write Python Test Scripts. 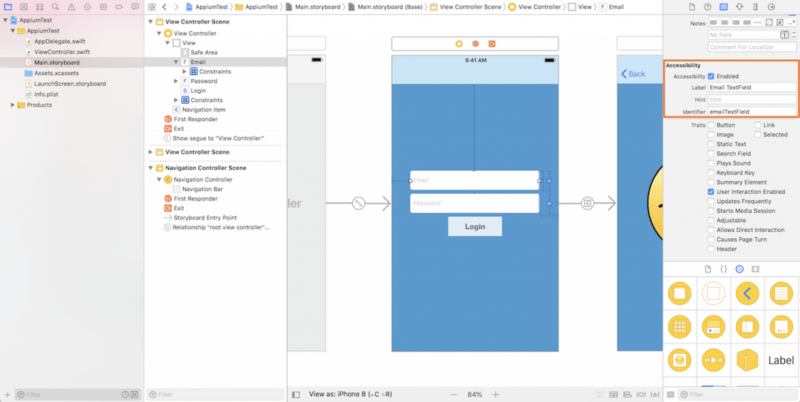 We learnt how to enable access UI elements in Xcode so they can be tested. We learnt how to integrate the 3 main components to automate a single flow of UI Automation Testing. We all deserve a pat on our back, one for completing the write up for this tutorial, and one for you to follow through this lengthy process to get your automatic test running! If you have any questions about the tutorial, please leave your comment below and let me know. For the sample project, you can download the full source code on GitHub. If you would like me to write follow-up tutorial with more advanced testing techniques for iOS using Appium, do not hesitate to drop me a comment.